Is it any wonder that a book which integrates profound theological discourses with fascinating fiction would make reference to George MacDonald? Baxter Kruger is one of my favorite writers on the subject of the Trinity. He earned his PhD from Kings College, Aberdeen University in Aberdeen, Scotland under Professor James B. Torrance (and if you haven't yet read Torrance's short but profoundly wise book, Worship, Community, and the Triune God of Grace, by all means do so as soon as possible!). 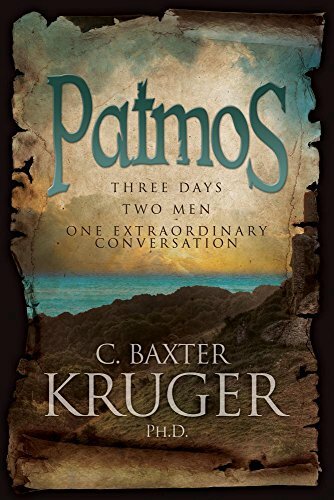 While Kruger has published many works of non-fiction (see our review of The Great Dance), Patmos is his splendid first novel. Not only does his story contain sublime thinking on our relationship with God, it is chock full of sometimes hilarious Southern-fried humor. "Lord Jesus...this is not fair! You promised life, and I have searched since my youth...Who on earth has worked harder? ...I carefully studied theology...I scoured the denominations...endlessly searching but finding no real answers..."
I doubt I'm the only one who can identify with Aidan! Fortunately for him, it turns out that he's been transported two thousand years back in time to the island of Patmos, where he meets the Apostle John, who only a few months before has completed his Gospel. The novel consists of the conversations between Aidan and John that take place during three days they share together. Not surprisingly, much of the substance of that conversation flows from the truths inherent in the triune nature of God. Much like his friend Paul Young, author of The Shack, Kruger's emphasis is on relationship, rather than doctrine; mankind is invited to share the relationship that Father, Son, and Holy Spirit have enjoyed since before the world began. In the translation of John's Gospel which Kruger favors, Johs' Gospel opens with "'In the beginning was the Word, and the Word was face to face with God.' Relationship is first," the Apostle explains, "relationship between the Word (that is, the Lord Jesus) and his Father." Early on, Aidan asks John to tell him more about the Holy Spirit, and the Apostle replies, "It is not wise to tell people about the holy Spirit; it is best to help them experience the Holy Spirit for themselves." When Aidan asks how, he's told "She's already in you, my brother...Ask her to make herself known [Kruger points out through John that "the word for 'Spirit' in Hebrew is feminine throughout the sacred Scripture'], and later adds that "The Holy Spirit exposes our darkness and unbelief to give us eyes with which to behold Jesus." The Spirit itself is a significant character in Patmos; if we are open to her, she will transform our lives, as she transforms Aidan's. "Together, of course. Jesus did that." The Apostle explains to Aidan that John 14:20--"In that day, you will know that I am in My Father, you in Me, and I in you"---is the "truth of all truths, the heart of the cosmos." And this is why the notion that sin--or anything else--separates us from God is "the great darkness," Satan's "chief trick [to] blind us to how close the lord is, closer than breath: we're in him, and he's in us." The quotes above all take place within the first 100 pages of this wonderful novel, and lay the foundation for the revelations that follow. It's a book well worth reading.